If you have been scammed by this lady and or her organisation you are eligable to file for compensation against her current assetts. You can also claim for compensation if you had funds deposited into her family bank. The bank was known as BANK KITA her advisory company was called KANTOR KITA. It is advised that you contact us a soon as possible for a full brief on how we can help you. Fill in the contact form below. 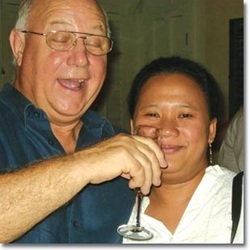 FIRST TAKE: Esti Yuliani with her then husband, Alvin Edmond, at a party in June 2007. The couple have since divorced. She is now married to a New Zealand National by the name of Richard Bowden Orange who resided in Hobart Tasmania. DENPASAR ~ Kantor Kita boss Esti Yuliani – also known as Julie Edmond – is known to have scammed at least Rp102 billion (US$10.2 million) but many victims have not reported losses and the final figure could be much more, Denpasar Police said this week. Yuliani is in custody at Poltabes Denpasar, where suspects are held after arrest and while investigations are continuing. She was arrested after a South African investor, John Grundlingh, 41, complained to police on May 29 that Yuliani had misappropriated Rp16,104,248,000 (US$1.6 million) transferred to her business account for purchase of land in Denpasar by a CV company Grundlingh had arranged for Kantor Kita to establish on his behalf. The money was transferred to Kantor Kita when Yuliani told him the certificated owner of the land had agreed to sell. But the land certificate was never produced and the landowner, named as Nahasnya, did not receive his money from the sale. Police investigations indicate that Grundlingh’s money was never entered in Kantor Kita’s accounting records. Police inquiries have also found that Grundlingh’s CV company, whose registered address was to be Kantor Kita’s office at Jl By Pass Ngurah Rai 379, Sanur, was established under a false certificate organised by lawyers employed at Kantor Kita.